Get a leg up (and out) with up to 7” more legroom, early boarding & more. Stretch out and relax with up to 38” of legroom, early boarding (all the better to nab that overhead bin), plus the fast lane to the security checkpoint. Why you want Even More Space. Go from roomy to roomier with up to 7” more legroom (that’s up to 38”!). 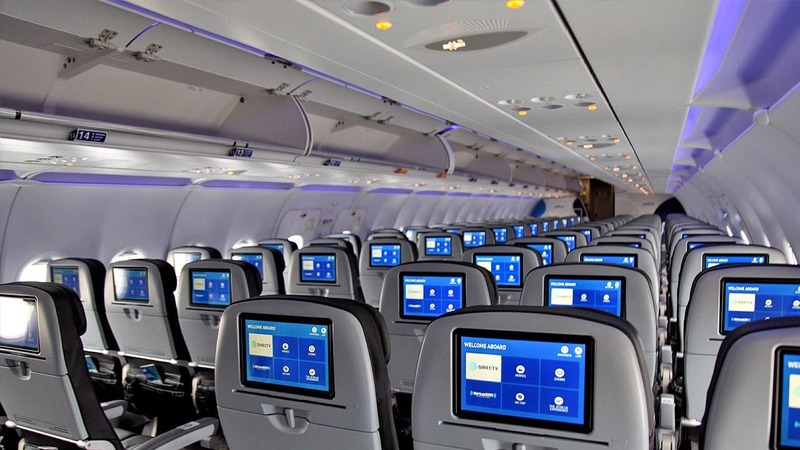 Even More Space seats are available on all JetBlue planes. Be among the first to board your flight. Plus, if you select an Even More Space seat in the first few rows, you can be among the first off the plane, too. Want to keep your carry-on bag close at hand? Take advantage of early boarding to get first dibs on that coveted overhead bin space. When you purchase an Even More Space seat, you'll also get Even More Speed, your fast lane to the security checkpoint (available in 60+ cities). Which seats offer Even More Space? Even More Space seats may be located at the front of the plane, in the middle or both. For detailed seating charts, see Our Planes. What can I expect from Even More Space? 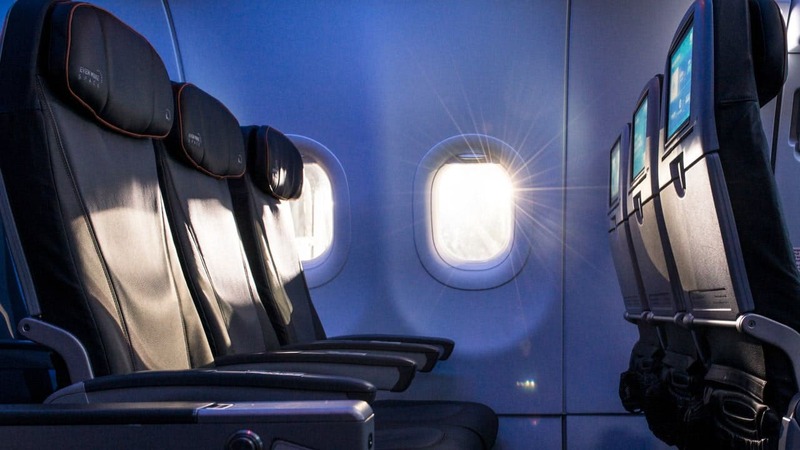 While all JetBlue customers get lots of room to stretch out, JetBlue is now proud to offer Even More Space—super-spacious seats that provide even more of that much-sought-after inflight space. Plus, Even More Space customers are able to take advantage of early boarding and early access to overhead bin space. How much does Even More Space cost? Even More Space is available for an extra charge which varies by route. To check the price on a particular flight, simply select an Even More Space seat from the seat map during booking or during the check-in process. Are Even More Space charges refundable? Currently, all Even More Space charges are refunded to the original form of payment should you need to change or cancel your flight. Charges are also refunded if JetBlue cancels your flight due to an operational disruption and cannot seat you in an Even More Space seat on your re-accommodated flight. However, all charges are forfeited if you paid for an Even More Space seat and later select a seat other than an Even More Space seat, or if you do not show up for your flight and have a pre-reserved Even More Space seat. Which seats onboard the aircraft offer Even More Space? We have two different configurations of our Airbus A321: an all-core layout with 190 seats and a layout that includes Mint, which features 16 Mint seats and 143 core seats. The all-core configuration has 40 Even More Space seats in rows 1 through 5, 10 and 23. Rows 10 and 23 are emergency exit rows. For the A321 with Mint, Even More Space is available in rows, 6-10 and 18-19 A, B, C, E and F. On our Airbus A320 aircraft, Even More Space is available in rows 1 through 5 and rows 10 and 11. Rows 10 and 11 are emergency exit rows. Due to the proximity of the exit rows, seats 9A, 9F, 10A and 10F do not recline. On our Embraer 190, Even More Space is available in rows 1, 12, 13 and 14. Row 12 is an emergency exit row. Are all Even More Space seats the same? All Even More Space rows, with the exception of row 1, offer more seat pitch than JetBlue's core seats. Row 1 cannot be measured by seat pitch because of the bulkhead wall, but still offers more space than the standard. Please note that row 1 does not have moveable armrests and the tray tables pull out of the armrests. Also, customers seated in row 1 must place personal items in the overhead bin during takeoff and landing. If you would like to take your items out during the flight, our inflight crew will be happy to help you retrieve your items. On our Airbus A321, an all-core layout has emergency exit rows in 10 and 22 and on a layout that includes Mint, the emergency exit rows are in 6 and 18. On A320 aircraft, rows 10 and 11 are emergency exit rows, and on our Embraer 190, row 12 is an emergency exit row. Get to your gate faster with your fast lane to the security checkpoint. Enjoy Even More Speed automatically when you purchase an Even More Space seat—or add it separately. Just look for the “extras” section when booking your flight or checking in. What can I expect from Even More Speed? While there are no guarantees of actual time savings, Even More Speed has been designed to provide the quickest possible lane to get through the security screening experience. In applicable markets, Even More Speed customers will be able to use expedited queuing lanes—not necessarily dedicated screening lanes. Who can use Even More Speed? Customers have two ways to take advantage of Even More Speed expedited security. 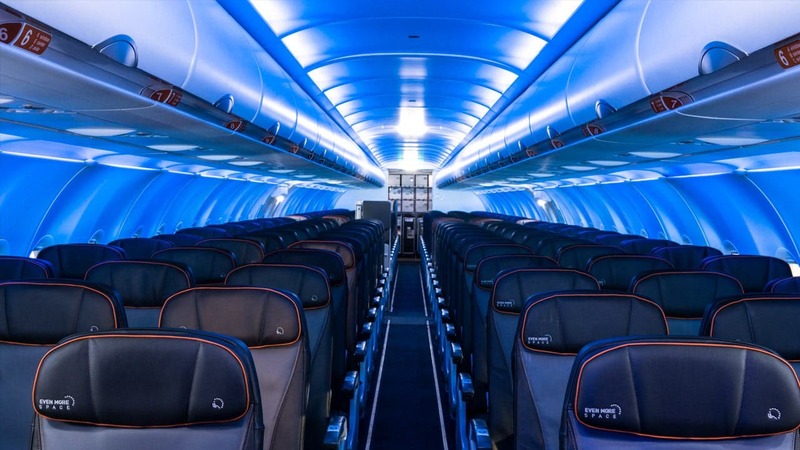 First, they may purchase an Even More Space seat which currently includes Even More Speed. Second, they may purchase Even More Speed as a standalone. In addition, Mosaic and Mint customers — and eligible travelers booked under the same reservation and confirmation code – have automatic access to Even More Speed as well. How do I purchase Even More Speed? Even More Speed is automatically offered to customers who purchase an Even More Space seat on the seat map when booking a flight or checking in. Even More Speed may also be purchased as a standalone in the Extras section while booking a flight or checking in. How do I take advantage of Even More Speed at the airport? Even More Speed access may vary by airport location. At some airports, Even More Speed signage will be visible at the security checkpoint entrance, while other airports may allow access to the "priority," "premium," or "business/first class" lanes. A JetBlue Crewmember at each airport will be happy to assist with questions on how to take advantage of Even More Speed. What credentials are necessary to take advantage of Even More Speed? Even More Speed customers simply need to show their boarding pass to the attendant at the security checkpoint entrance. The Even More Speed logo is printed on the boarding pass. I purchased Even More Speed but my travel companion(s) did not. Will they be able to take advantage of Even More Speed? No. Only those customers with the Even More Speed logo on their boarding pass may take advantage of this product. Sometimes, only a fully lie-flat seat will do. Learn more about Mint, our refreshing take on premium travel. Join U.S. Customs & Border Protection’s program for a fast-track through U.S. Customs in select airports, plus TSA Pre✓.